Like a snake slithering back into its den, Greenland’s lengthy Jakobshavn glacier has retreated over 25 miles since the 19th century. And for the last two decades, this warming river of ice has purged more ice into to sea than any other Greenland glacier. But since 2016 — and after 20 years of unprecedented melting in Greenland — Jakobshavn’s rapid retreat has slowed down considerably and the glacier has even grown bigger. This might appear to be a rare dose of good news for the Arctic — a place that’s heated up over twice as much as the rest of the planet. 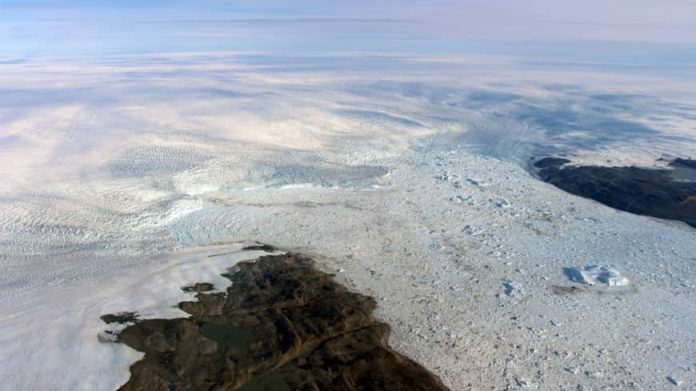 Instead, a team researchers led by scientists at NASA’s Jet Propulsion Laboratory discovered that Jakobshavn’s stagnated melt is only a temporary blip brought on by cooler ocean currents. Though worryingly, the recent slowing also carries ominous news for the thawing landmass. The research, published Monday in the journal Nature Geoscience, reveals that the Jakobshavn glacier — whose ice reaches some 2,600 feet under the sea — is extremely sensitive to changes in ocean temperature. That’s a big problem because the dynamic ocean currents off western Greenland will naturally warm up again — on top of the reality that Earth’s absorbent seas soak up over 90 percent of the planet’s accumulating heat. These incessantly warming waters spell a grimmer future for both Jakobshavn and Earth’s rising seas. “If these deep glaciers are this sensitive to the water, then we could be looking at faster sea level rise out of Greenland than we thought,” added Willis, an oceanographer. Other Greenland experts agree that Jakobshavn’s recent stagnation is not optimistic news. “This study does not mean we are out of the water,” said Luke Trusel, a geologist at Rowan University who had no role in the study. “In fact, I’d say it says the opposite by demonstrating just how sensitive this major glacier is to changes in the ocean.” Trusel recently visited and published research on Greenland’s accelerating melt.